According to Church law, a shrine is “a church or other sacred place which, with the approval of the local Ordinary [bishop], is frequented by the faithful as pilgrims by reason of a special devotion”. That is why “certain privileges may be granted to shrines when the local circumstances, the number of pilgrims and especially the good of the faithful would seem to make this advisable”. A shrine therefore is a church entrusted by the local bishop with a special purpose, as opposed to a parish church, which exists to serve Catholics who live in a particular territory. Why is St Walburge’s a Shrine? 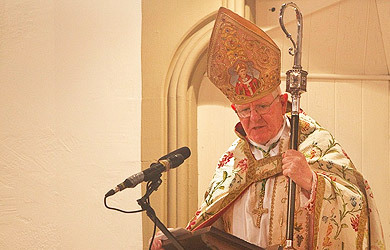 The shrine church of St Walburge, Preston exists especially as a centre of Prayer and Eucharistic Adoration as well as serving as a home for those who wish to discover the traditional Latin liturgy (sometimes called the ‘Extraordinary Form’) in Preston and the wider Diocese of Lancaster. A shrine, unlike a parish, does not have geographical boundaries. Geographically, the Shrine of St Walburge lies within the territory the Parish of St Walburge and the Sacred Heart, Preston but the shrine exists to serve all interested persons wherever they may live. The pastoral care of the Shrine has been entrusted to the Institute of Christ the King Sovereign Priests. Everyone is more than welcome at the Shrine. There are no special requirements to be a member of the community – and no need to have any previous knowledge of Latin! 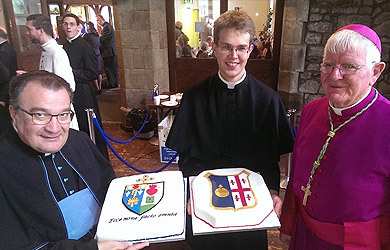 The Shrine is fully a part of the Diocese of Lancaster, like any other church. The church is open daily from 8am to 8pm for visits and personal prayer. 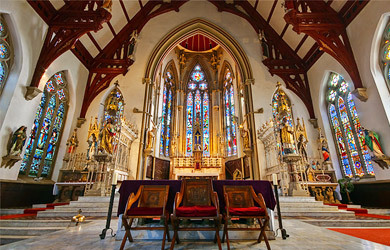 Holy Mass and Eucharistic Adoration are held in church every day; confessions are available every day before Mass, or at other times upon request. Depending on the town or the neighbourhood where you live, you automatically belong to a particular territorial parish. 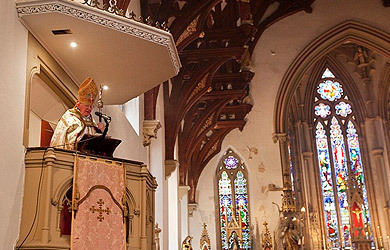 In former times Church law was fairly strict about the obligation to remain in one’s local parish in order to receive the sacraments and to fulfil one’s Sunday obligation. Nowadays, in view of the increased mobility of modern times and in order to respect the liberty of the faithful, the Church has relaxed these rules. All Catholics are free to attend Mass in any Catholic church they choose. It is even possible to become a regular member of a church or shrine that exists for a special reason other than geography (to cater to the needs of a given nationality, for the use of a certain liturgical rite, etc. ), regardless of where one lives. Everyone is welcome to attend Mass (on Sundays or any other day) and to go to confession at the Shrine, just as at any other Catholic church. If you wish to receive one of the other sacramental rites usually administered only in a parish – baptism, confirmation, marriage, etc. 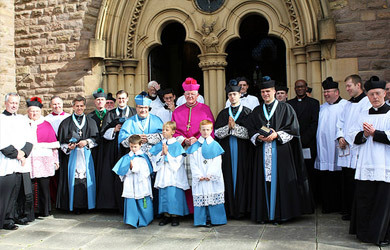 – it is normally necessary to become a regular congregation member of the shrine, which was established to provide the liturgy and sacraments in their traditional form. On the other hand, if you do not generally come to the shrine but still wish to be confirmed, married, etc., at the Shrine for personal reasons, this is sometimes possible but you will first need to obtain the permission of your local parish priest. 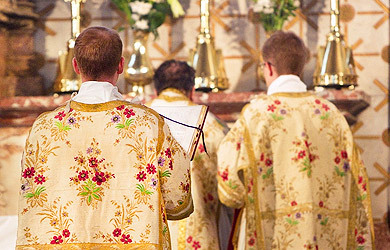 The same thing that happens at every Mass: Jesus Christ offers to his heavenly Father the perfect sacrifice of his Body and Blood under the outward appearance of bread and wine, through the ministry of the priest. Whatever rite or language are used, it is the same sacrament and the same sacrifice being offered. 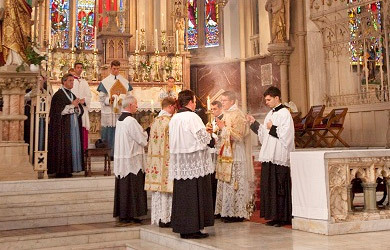 Our participation in the Latin Mass is based above all on our prayerful, interior participation. Books containing all the texts in Latin with an English translation are available at the back of the church; please feel free to use them. The little bit of extra effort needed to follow along helps us to pay closer attention to the various parts of the holy sacrifice that is being celebrated. 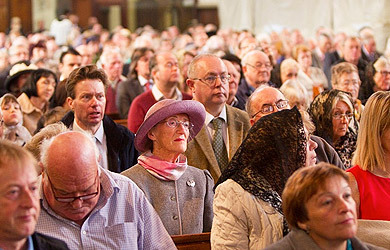 The priest celebrates Mass facing the altar – together with the people, in the same direction – as the leader conducting his flock towards Christ. 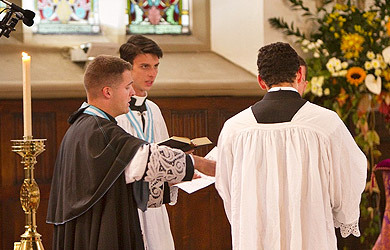 The overall structure of the ceremony is the same that you are already accustomed to: the first part of the Mass contains prayers of preparation and readings, then the sermon; the second part contains the Offertory (offering of the bread and wine to be consecrated), then the Consecration itself (we look up to adore Christ at the elevation of the host and chalice), then the communion rite and final blessing. If you have further questions about the meaning of the various aspects of the liturgy please do not hesitate to ask the shrine clergy, who will be happy to explain! The Mass is offered in Latin, the Church’s sacred language. The Latin tongue not only unites Catholics of all races, languages and backgrounds, but it also unites us across time with our distant ancestors in the faith going back two thousand years to the time when St Peter, the first pope, planted the seat of the universal Church in Rome. The beauty of the music and ceremonies is intended to lift our minds and hearts to God and to express his unspeakable majesty. The use of a special liturgical language like Latin reminds us that – although the Mass is offered for the people – it is above all an act of adoration offered to God alone, even if we do not perfectly understand every word. At the back of church you will find booklets containing English translations of the texts of the Mass for you to follow. The major parts of the Mass (called the ‘Ordinary’ of the Mass) remain the same from day to day: after attending the Mass a few times, it is easy to get used to the sense and meaning of these prayers. The ‘Proper’ of the Mass consists of the parts that change from day to day. Translations of the Propers of the Mass for each Sunday or feast are contained on a separate sheet at the back of church. 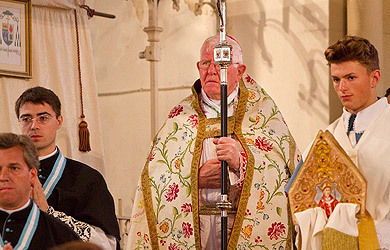 The Institute of Christ the King Sovereign Priest is a Society of Apostolic Life with headquarters and an international seminary in the archdiocese of Florence, Italy, and priests working in numerous dioceses on three continents. 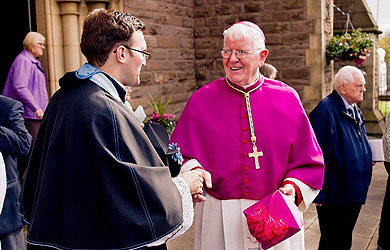 The Institute, was founded under John Paul II in 1990. 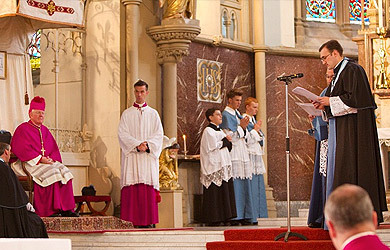 In 2008 the Church granted the Institute the status of a ‘society of pontifical rite’, directly dependent on the Holy See.The Institute is a missionary society devoted to promoting the reign of Christ the King in every aspect of human life. In addition to the canons of the Institute and the seminarians in formation, the Institute also includes brothers (called ‘oblates’), who offer their talents to God without going on to the priesthood, and a branch of contemplative sisters called the Adorers of the Royal Heart of Jesus. In keeping with its charism of fostering the union of faith and culture and promoting sacred art for the glory of God, the Institute have restored or built several churches in the United States, Europe and Africa.